Keep Your Eats Drama-Free: Where to dine before heading to QPAC! Mamma Mia! It’s that time of year again where QPAC is burgeoning with their best shows, and grumbling stomachs definitely aren’t on the programme. Hey, you’re slipping out of those Netflix-reserved PJs and getting dressy for a night on the town – why not start the night with a few show-stoppers? Let’s face it: belting out ABBA with the sopranos can make a gal parched, and while we love the Nutcracker, we’re dreaming of the sugar plums far more than the fairies. It’s time to raise the curtain on the city’s top feasts and save yourself from spooking fellow theatre-goers with your hanger (ala Rocky Horror). It’s a hard knock life, but the sun’ll come out with a simple ‘hello, please!’ At Hello Please, nothing brings about a round of applause more than their aromatic lamb shoulder pancakes, chicken coconut curry, or crispy corn fritters with young coconut and chili jam. Go ahead, take a bao. La La Land may have blown away theatre critics this year, but in the foodie scene, French-inspired La Lune reigns supreme. Drop by for a jaw-dropping line-up of crisp Rieslings, theatrical Champagnes, and Pinot Noirs with more simmer than Wicked’s Elphaba. First, a play on words – then, a play. Chu on some of Brisbane’s biggest flavours before its biggest talents take the stage. Just a short wander down Fish Lane, you’ll indulge in steamed duck buns, pork and kimchi spring rolls, and deep fried ice cream layered in raspberry chili caramel. Showtime. Set the scene for a night to remember with a pizza the action at Julius. Right across the road from Brisbane’s cultural precinct, you’ll enjoy a moment in the wings with the Fish Lane spot’s famous Tartufo pizza, fried baby calamari, and flat ribbon pasta with duck ragu. Take that, Pavarotti. Forget the yellow brick road – the fish road’s where it’s at. Follow Fish Lane’s trail of blue, patterned street art to hideaway bar Maker. Sitting across from Hello Please, this hole-in-the-wall bar plates up a range of monologue-worthy gourmet toasties (pastrami and gruyere, the true leads), charcuterie plates, and seasonal cocktails. Don’t expect your standard martini here: these guys mix up craft spirits with Australian seasonal ingredients – from dustings of bee pollen to fresh mulberries. Forget breaking a leg – tapping a keg’s the new theatre tradition! Take on Charming Squire just across from QPAC for a brew-ha-ha before the main event. With a tap list worthy of the red carpet, you’ll catch half the theatre in this nearby beer hall. Stop in for fare from the iron bark coal pit, with wagyu beef, or pork with apple sauce to pair with pints of amber ale. All the world’s a stage: and sorry, Shakespeare, but you’ve got nothin’ on this. You might as well be on Broadway with these New York flavours, and QPAC’s just a short stroll (or full-belly Uber ride) away. Do we find twice-cooked onion rings and cheeseburger empanadas more captivating than West Side Story? Maybe. Are we going to mention it to the Tony Award reps? Probs not. ‘Dinner and a show’ has never rung truer. 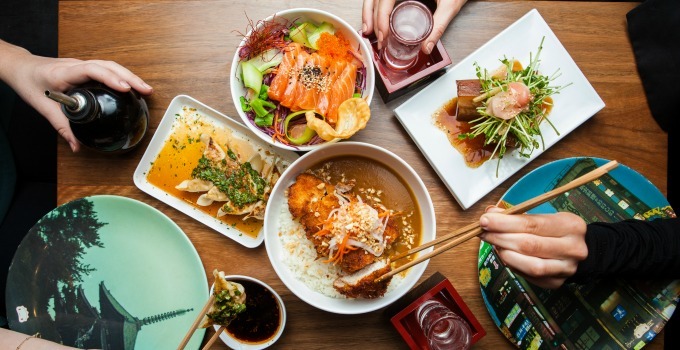 From grilled pork gyoza with your own dipping sauce concoction (PSA, go light on the vinegar), to bowls of katsu curry and takoyaki, Harajuku Gyoza definitely takes centre stage. Oh, and with a finale heavy with Nutella-filled gyoza, you’ll want to stick around for the whole production. Hitting the concert hall with the whole family? Treating the girls to a night at the ballet? Share the fun at Junk, a fond believer of the ‘sharing is caring’ system. Take a high-set table for boozy bubble tea and cheeky share plates of peking duck spring rolls, fragrant beef massaman, and gunpowder chicken ribs. Hey, don’t gnocchi the theatre; it’s a noble profession. Just not quite as noble as the folks at Spaghetti House, who craft some of the top Italian fare just an arm’s length from QPAC. If we had a penne for every time we made it to halftime with the belly rumbles, we’d probably have whinged less. Anyway, swing by for packed-to-the-rafter serves of Ragu alla Bolognese, or potato, pancetta, and rosemary pizza. Think we should have a rehearsal night first? - the gourmand who knows the performance is only as good as the snacks you get at intermission.